There are many struggles with having long hair, especially thick long hair. You use way too much shampoo than is probably normal, it always seems get stuck in/on everything and it of course takes hours to style. You could go and have a cut, but if you're anything like me then we both know that's not a possibility, so we have to make do with what we have. One thing I have mastered is drying my hair in about 7 minutes, this has made a huge difference when I'm getting ready. 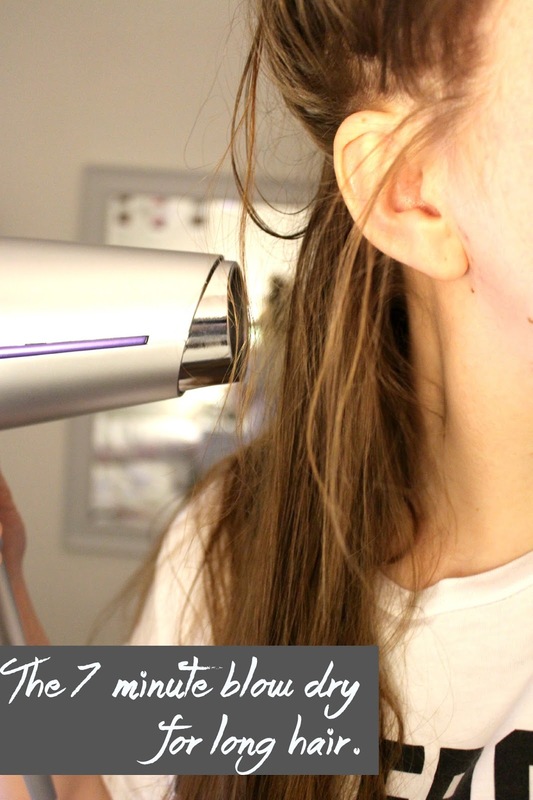 If you have long hair like me and want to be able to dry your hair quickly with minimal effort then this post is definitely for you, if you have shorter or thinner hair then you could definitely do this in less than 7 minutes. This is all baring in mind you have a hair dryer with a decent amount of power, I use the John Freda Salon Shine dryer which I was gifted for Christmas and it's amazing. Firstly you need to prepare prior blow drying, make sure you wring and squeeze all the excess water out of your hair after washing and then use a towel to absorb the water, towel drying your hair makes a massive difference to reducing the blow dry time. The most important bit of aiming for a quick blow dry is sectioning your hair, I never used to section my hair which meant the back of my hair and the underneath layers took longer to dry and it also meant I was damping the top layers that were dry by brushing through to the underneath layers. To section the hair I use a hair band or scrunchie, but you can use a large a clip if you have one. You need to start by leaving the underneath layer of your hair exposed and pinning the rest up, just make sure the layer exposed isn't too thick. You then need to brush the section, I use a Tangle Teezer to brush through my wet hair. Once the section is brushed it's time to blow dry, it's completely up to you if you do this with your hands or with a brush, or both like I do. You can also dry your hair upside down to gain a bit of volume and ensure you dry the underneath well. It then just about sectioning, brushing and drying, in that order. I normally section my hair off until I reach the top layer where I dry my parting. I always find the crown of my head the hardest to dry as it's where the thickest part of my hair is, so I tend to brush through it a lot to encourage it to dry quicker.